We have created thousands of California estate plans. We have also handled numerous California trust administration cases. Read reviews from our happy clients. James F. Roberts & Associates assisted us in the administration of our mother’s estate. They provide absolutely wonderful service. It has been a very positive experience. Christina M.
We recently created a living trust with Holly and others among the super staff here. Holly balances expertise, clear communication, and care in a great way. She Interpreted our wants quickly and helped us craft a solution that was right for us. We recently moved to California from the Midwest, and it is great to have the right support in place for things as important as this. 5 stars. 100 stars. The law offices of James Roberts did our will and trust in 2002, redid our trust in 2013, and redid our trust a third time this year. People do not realize that laws change over time and it is important to revisit your trust. This is a gift to your heirs. No one wants to pay unnecessary taxes and they can help you protect your interests. Their office explains things in great detail and helps you through every step of the process. They bring up ideas you may not have thought about. Protect your estate and take advantage of their superior services. It was a pleasure to work with such a high quality firm. I was pleased with all aspects of my experience but especially with the quality of the employees who assisted me. Attorney Cagna Basar is terrific! She is very patient and kind. She is certainly most competent and knowledgeable and pleasant to work with. I feel truly confident with her expertise. The entire firm houses superlative personnel! We worked with Holly Nabiey to establish our fathers' living trust and will. She was very knowledgeable and thorough. She took care of everything and explained what everything was and what we had to do next. She was very responsive and professional. I would recommend all my friends and family to set up a living trust/will, and go through the Law Office of James F. Roberts and ask for Holly! My family and I can rest easy now we have our fathers affairs in order. We were faced with an out of the ordinary situation. We received very good advice and our problem was satisfactorily solved. We are very happy with the service we received from James. Very highly recommend them. Staff is committed to giving extraordinary service and peace of mind. Good experience. Have been client for about 15 years. 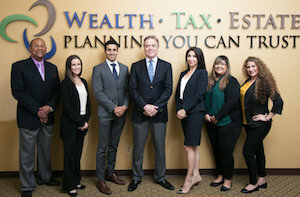 Estate planning the best. I recommend this office. Recently amended our Trust with James Roberts. Extremely thorough, very professional and provided clarity throughout the entire process. Overall an excellent experience. Had a great experience. I would recommend to anyone. Was very pleased with the service and knowledge of the staff. Attorney Roberts is an excellent attorney to work with on getting a trust created. I really like him and his staff. I found them to be quick, reliable, and they do a good job! Thank you for all you do in the Anaheim community.